I replied, ‘Why do you assume I see two roads?’” Author unknown. The above quote sounds all very Alice-in-Wonderland’ish but it was taken from a website entitled ‘Depression, Suicide & Self-Injury Quotes’. And it startled me out of an assumption I have long held to be the truth. The basic assumption is that the person who continues to choose the hard road through life actually sees an alternative – that there are two roads, not just one. In relation to depression or any maladaptive behaviour which continues to hold sway over a person’s life long past the time when that behaviour had value and relevance, I have come to believe there is choice involved. Sometimes the ability to choose is buried way down deep or hidden way back in the dim mists of our past. Over time we may come to believe we have lost the freedom to choose because a particular action or emotional state has become so much an integral part of our being. Life continues to surprise me. For which I am eternally grateful, as there was a time when my mind was so totally closed against any notion of unexpectedness or unpredictability, any possibility of life-being-any-other-way, it both frightens and amuses me to look back on it now. But I also have a greater empathy and understanding for that long-ago depressed self than I had at the time. I now see shutting down and shutting off from the world as a natural response to the death of my mother, the person I loved most in the world, rather than an abnormal reaction. The source of my surprise – a graph presented at a workshop on grief – in itself, surprises me. Having long since given up on the validity of statistics – as Mark Twain famously noted, ‘There are three kinds of lies: lies, damned lies, and statistics’ – it was enlightening to see the wave-like shape of grief over time. Anyone who has experienced grief will recognise that it comes in waves. We even speak of waves of emotion but to see something represented visually is always far more effective than having only the verbal description. The presenter of the workshop stated that over the first 12-13 month period – that first year after someone we love has died in which we have birthdays, anniversaries, holidays without that person in our lives – we always experience grief at a 100% level. We may expect our grief to diminish after a set period of time and when it is still at the same level after 6 months or 12 months, when a song or a scent or a visual reminder sends us back to that initial high level of loss and sadness, we may begin to think there is something wrong with us. Being able to see the shape of these waves – the peaks wide and close together at the beginning, narrower and further apart as time progresses – was an Aha! moment for me, an ‘of course, how could it be otherwise’ dawning of comprehension. It’s that deeper understanding that comes via images as opposed to words. It’s why I view the combination of image plus language as being so powerful. To draw a picture of something as ephemeral as an emotion gives us another tool with which to change an entrenched behaviour, to choose one road over another. These days, I see Depression as a place. Literally. It’s a town I used to live in for a period of my life. And as a traveller for many years, I know that to get to any destination you have to travel a certain path, take steps along that road and there are signposts on the way that tell you where in your journey you now are. The more conscious I become, the more mindful of the connection between my internal world and my external reality, the more often I take responsibility for stayin’ the hell outta that town called Depression. The more images and metaphors I develop, the more concrete I make my internal world and its emotional territory, the more easily I navigate the tricky bits. All of this means that I am able to take back my life as mine and hold it as the precious possession it is. When my father died almost four years ago, I had planned to start my studies in Transpersonal Art Therapy. Mum’s death and my ensuing depression meant that my previous intended career as an Anthropologist was aborted before it began. Knowing my father would have been saddened if that happened again, I did everything within my power to embark upon my intended studies. An early art therapy exercise to access our own deep wisdom resulted in me sitting on the grass crying for my father. 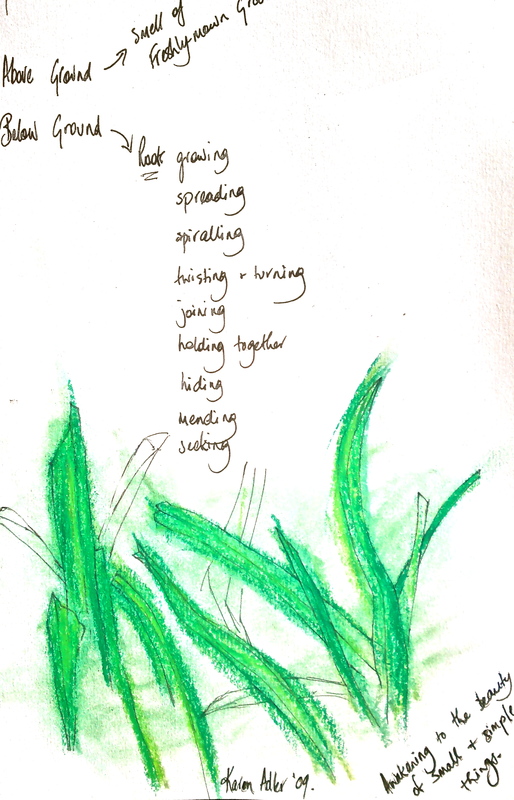 I focussed on what was under me and around me and I was able to do a drawing and make meaning from the smell of freshly-mown grass and to focus on my life. As my father would have wished for me. If we are making our way through grief or depression, trying to find another road or a new way of being or just trying to survive another day, utilising both sides of our brain via the combination of words and images, can be of immense benefit. It can help us see two roads ahead of us, not just the one. Silver, Rawley. Aggression and Depression Assessed through Art: Using Draw-a-Story to Identify Children and Adolescents at Risk, New York, Brunner-Routledge, 2005.